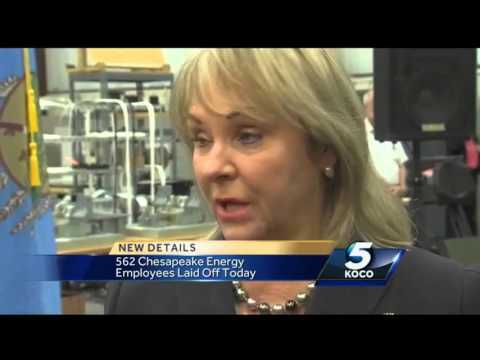 Chesapeake Energy Corporation is one of the most prominent companies in Oklahoma. There are a few energy companies based in the state (e.g. Devon Energy and SandRidge Energy), and they seem to have suffered during the recent downturn. Other US land focussed companies in Texas, and North Dakota seem to have stormed through regardless of oil prices. The reason might be that some regions, (such as the Permian Basin) are more productive. While debt is an issue for the shale industry as a whole, there still needs to be the possibility of rosy accounts, to create forward confidence for loans and investments. October 2013: After a period of constant layoffs, where dozens of workers found themselves out of work, headlines were made. 800 additional employee contracts were terminated, 640 just at the company headquarters. This bought the national tally, down to 11,000 with around a third in Oklahoma City. This news marked the end of a transformational period. Over the past several months, we've been going through a transformation process that has included evaluating all aspects of our business. That transformational process has concluded. September 2015: Due to the oil price downturn, Chesapeake Energy cut around 15% of its workforce. The cuts amounted to 740 people, 560 in the Oklahoma City headquarters. With attrition over a previous couple of years due to layoffs and people leaving voluntarily, the company headcount was down to 4000, with 2500 in the city head offices. January 2018: The company announced that it would cut 400 people, around 13% of its total staff. Again most of the cuts were from the city offices. Many job losses were as a result of the previous sale of assets, where staff were kept on during the transition period. Around 25% of the wells owned by Chesapeake Energy have been sold off in the past few years. The main reason for the divestments was to cut the massive debt load that had accumulated. Other reasons included being more efficient and trying to operate within current cash flow. Of these cuts, 330 were in the city offices, with field offices in Texas, Louisiana, Pennsylvania, Ohio and Wyoming also feeling the brunt. This latest staff reduction left the company at around 1800 in the head office, and about 1100 elsewhere, putting the company total at 2900. Overall, massive debt built up by the original company founders continue to hang over the company until now. The recent oil price rally hasn't helped Chesapeake much since its focus is on gas production.